Setting the Stage: At the beginning of 1864, Ulysses S. Grant was promoted to lieutenant general and given command of all Union armies. He chose to make his headquarters with the Army of the Potomac, although Maj. Gen. George G. Meade remained the actual commander of that army. He left Maj. Gen. William Tecumseh Sherman in command of most of the western armies. Grant understood the concept of total war and believed, along with Sherman and President Abraham Lincoln, that only the utter defeat of Confederate forces and their economic base would bring an end to the war. Therefore, scorched earth tactics would be required in some important theaters. He devised a coordinated strategy that would strike at the heart of the Confederacy from multiple directions: Grant, Meade, and Maj. Gen. Benjamin Butler against Robert E. Lee's Army of Northern Virginia near Richmond; Maj. Gen. Franz Sigel to invade the Shenandoah Valley and destroy Lee's supply lines; Sherman to invade Georgia and capture Atlanta; Maj. Gen. Nathaniel Banks to capture Mobile, Alabama. 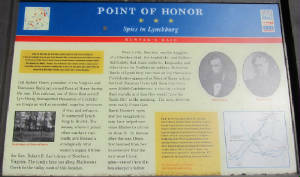 The Battle of Lynchburg was one of many battles fought during the Lynchburg Campaign. The Lynchburg Campaign, also known as Hunter's Lynchburg Campaign, Hunter's Campaign, and Hunter's Raid, was part of the 1864 Shenandoah Valley Campaigns and was the first of three principal campaigns fought throughout the valley region. 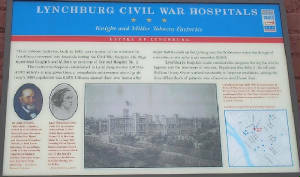 Although not geographically part of the Shenandoah Valley, Lynchburg served as a major rail and canal center, supply depot, and hospital complex for the Confederacy. Produce from the Upper Valley could be shipped there by road or stream and thence to Richmond on the James River Canal, the Southside Railroad, or the O&A Railroad via Charlottesville and Gordonsville. The Southside Railroad linked Richmond with the western Confederacy through its connections with the Virginia & Tennessee Railroad. The Southside Railroad continued to supply Richmond, with interruptions from Federal raiders, until the Battle of Five Forks (1 April 1865). As the war progressed, Lynchburg, too, became an important objective of Union campaigns in the Valley. In 1864, several expeditions--up the Valley from Winchester, and north from Bulls Gap, Tennessee--were devised to capture Lynchburg, but the city remained in Confederate hands until the end of the war. For the Union, defending the vulnerable B&O Railroad and the line of the Potomac River were essential considerations for any operations in the Shenandoah Valley. Because of implicit threats against Washington, a small Confederate army in the Valley could pin down three to five times its number in Union defenders, threaten vital Union transportation and communication lines, and carry the war to the North, if opportunity presented itself. 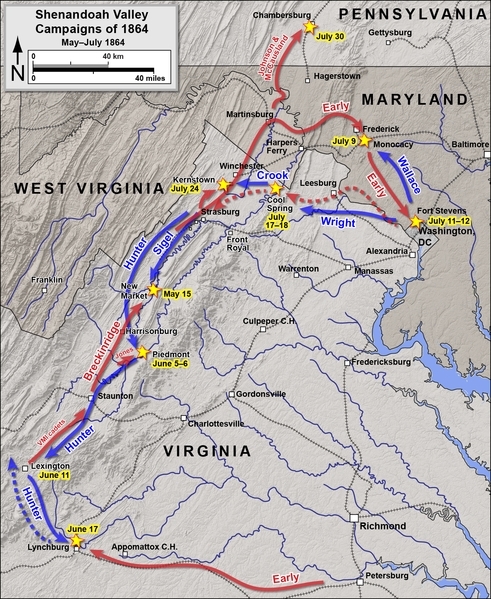 As the war continued, the Shenandoah Valley increased in importance to the Southern cause, and correspondingly it became more urgent that the Northern armies succeed there after dramatic failures in 1862, 1863, and May 1864. Ultimately, the Northern army was forced to lay waste to the agricultural abundance of the Valley in order to destroy support for the Southern war effort. The Battle of Lynchburg was the third and final battle of the Lynchburg Campaign. Following Maj. Gen. Sigel's poor performance at New Market, he was relieved of command and then replaced by Maj. Gen. Hunter. Having enjoyed recent success at Piedmont, Hunter moved on Lynchburg in a concerted effort to press and roll Gen. Lee's flank. 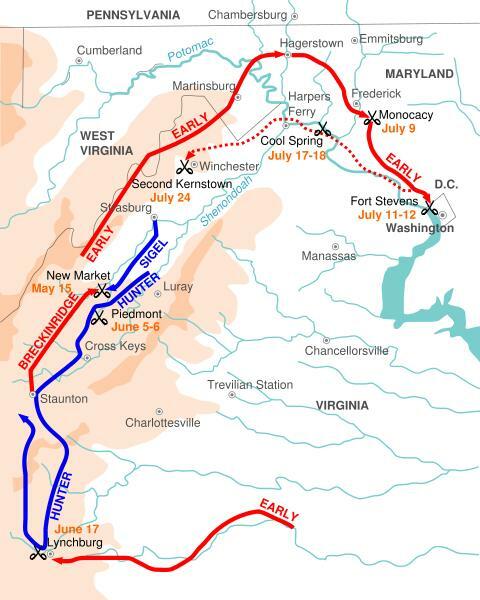 After the failed Union attempt, two more campaigns would unfold during the Valley Campaigns: the Confederate Maryland Campaign and the Union Shenandoah Valley Campaign. While Lt. Gen. Jubal Early would enjoy many battlefield successes, he would ultimately find himself fleeing from Maj. Gen. Phil Sheridan with only his staff, and then relieved of command by Gen. Lee. The following month would witness Lee surrendering to Grant. 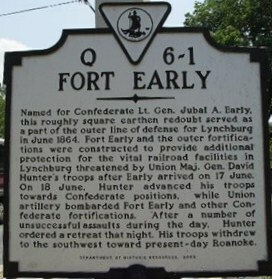 Battle: Early arrived in Lynchburg at one o'clock on June 17, having been sent by General Robert E. Lee. Three hours later, Averell encountered McCausland's and Imboden's dismounted cavalry entrenched at the Quaker Meeting House, four miles from the city. The Confederates were driven back after Col. Carr B. White's brigade moved in to support Averell. Two brigades of Major General Stephen Dodson Ramseur's division occupied the area around a redoubt two miles from the city and hindered the Union advance. Hunter made Sandusky his headquarters and planned the attack on Early's defenses. That night, trains could be heard moving up and down the tracks. Also, various instruments such as bugles and drums were heard by Hunter's troops. Even the people of Lynchburg made noise by having bands play and citizens scream. Their goal was to make the Confederate army seem larger than it really was. On June 18, Major Generals Arnold Elzey and Robert Ransom, Jr. arrived from the Confederate capital of Richmond, Virginia. Elzey assumed command of Breckinridge's infantry and dismounted cavalry while Ransom superseded Imboden as commander of the mounted cavalry. Early elected to remain defensive and wait for the rest of the Second Corps to arrive. The redoubt now known as Fort Early was at the center of the Confederate line, with Maj. Gen. John Brown Gordon's division on the left and Brig. Gen. William G. Lewis's brigade on the right. McCausland commanded the right flank, which included a redoubt, and Elzey's command defended the area between it and Lewis' brigade. Col. Scott Shipp's VMI cadets were placed in reserve at Spring Hill Cemetery while the inner defenses were occupied by the Confederate Home Guard. Hunter, still not convinced that Lee had sent reinforcements to Lynchburg, deployed Sullivan's and Crook's divisions in front of the Confederate center, with Averell in reserve, and sent an order to Duffié to attack the Confederate right. Reconnoitering the line in an effort to find a weak spot to push his infantry through, Hunter ruled out a direct attack on the redoubts, for they appeared too strong. He allowed Lt. Col. Henry A. du Pont to deploy his thirty-two cannons. Crook was sent to flank the Confederate left, but marched a few miles before finding it impracticable. The Confederates attacked Sullivan and du Pont, who managed to hold them at bay until Crook returned. The Confederates fell back after a half hour of fighting, but spent the next hour and twenty minutes attempting to break through the gap between Sullivan and Duffié before withdrawing to their earthworks. A regiment of Col. Rutherford B. Hayes' brigade pursued them but were beaten back. Meanwhile, McCausland succeeded in holding off Duffié's assaults. As ammunition ran short, both Hunter and Duffié became convinced that they were outnumbered. Early then prepared to begin an attack of his own, but Hunter retreated at nightfall. 1757: Lynchburg is founded when John Lynch establishes a ferry service along the banks of the James River. 1860: Lynchburg has a population of 6,853, including 3,802 free whites, 357 free blacks, and 2,694 enslaved African Americans. May 23, 1861: Lynchburg unanimously voices its approval to leave the Union in a statewide referendum. June 17, 1864: During the Battle of Lynchburg, Confederate troops under the command of Jubal A. Early drive off the forces of Union general David Hunter, whose retreat cedes control of the Shenandoah Valley back to the Confederates. 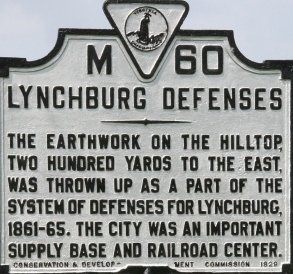 April 6–10, 1865: The state government relocates to Lynchburg. When Union forces chase renegade remnants of Robert E. Lee's Army of Northern Virginia into the town shortly after the Confederate surrender on April 9, they find a city on the verge of chaos and civic leaders who are eager to make peace. 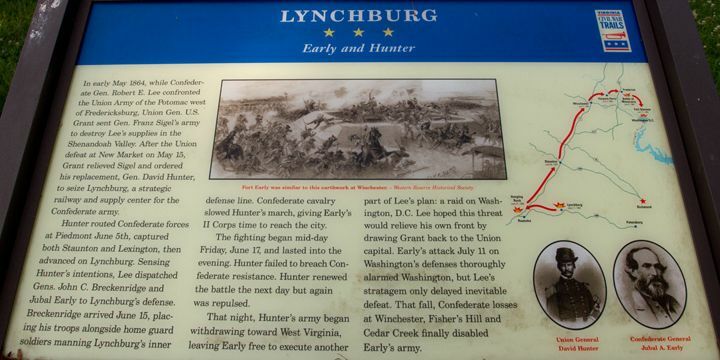 Aftermath and Analysis: Lynchburg, which served as a Confederate supply base, was approached within 1-mile (1.6 km) by the Union forces of General David Hunter as he drove south from the Shenandoah Valley. 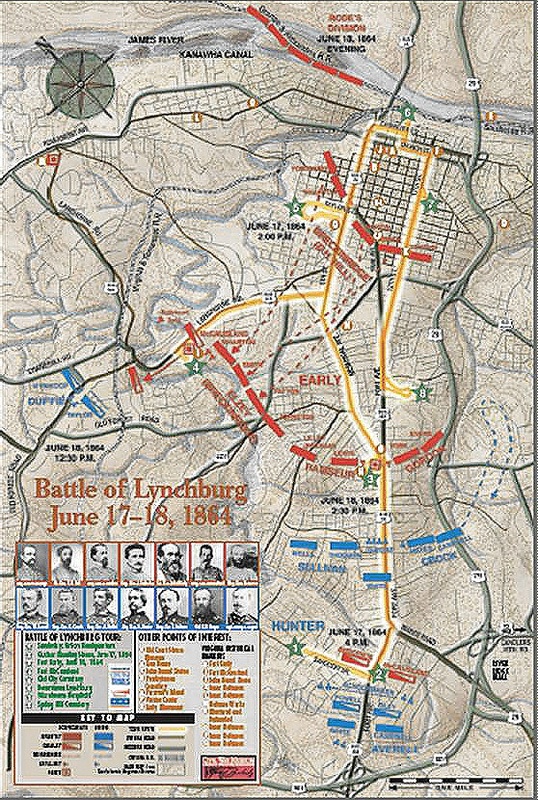 Under the false impression that the Confederate forces stationed in Lynchburg were much larger than anticipated, Hunter was repelled by the forces of Confederate General Jubal Early on June 18, 1864, in the Battle of Lynchburg. To create the false impression, a train was continuously run up and down the tracks while the citizens of Lynchburg cheered as if reinforcements were unloading. Local prostitutes also took part in the deception, misinforming their Union clients of the large number of Confederate reinforcements. 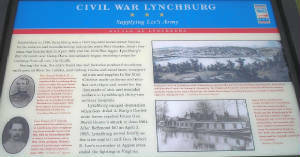 (Right) Civil War Spies and Battle of Lynchburg. The Battle of Lynchburg was fought on June 17–18, 1864, less than two miles outside Lynchburg, Virginia, as part of the American Civil War. The Union Army of West Virginia, under Maj. Gen. David Hunter, attempted to capture the city but was repulsed by Confederate Lt. Gen. Jubal Anderson Early. Then, Early's army moved sixty miles in three days chasing Hunter. At that point, Early halted the pursuit and awaited for Hunter to make a move. Hunter decided to move across the Shenandoah Valley and into West Virginia. The Battle of Lynchburg proved to be quite helpful in the Confederates' fight against the Union. Hunter's retreat made it possible for Early to freely move up the Shenandoah Valley. Early's army advanced up through Maryland and even made it as far as Washington, D.C. This was an obvious victory for the Confederates because it allowed them to move further north and allowed their supply lines to remain open via the railroads. Advance to: History of Lynchburg, Virginia, Shenandoah Valley Campaigns of 1864: The Battles, and Shenandoah Valley Campaigns of 1864-1865. Sources: National Park Service; Civil War Trust; Official Records of the Union and Confederate Armies; National Archives; Christian, W. Asbury. Lynchburg and Its People. Lynchburg: J.P. Bell, 1900.